Being Frugal and Making It Work: 2014 Savings Challenge: How to Save $1400 in a Year! 2014 Savings Challenge: How to Save $1400 in a Year! Did you know that by putting a little money away each week that you could save nearly $1400 in a year? This is a simple and cost effective way to save for those unexpected emergencies, household or vehicle repairs or even your family vacation. We all know that a penny saved is a penny earned, right? I'm also one that never passes a penny on the ground without picking it up and putting it my pocket! As a frugal shopper, I'm always looking for new ways to save, both for the present and the future. You never know when your savings or rainy day fund will play a vital role. Every cent adds up... and you can save nearly $1400 in 52 weeks! 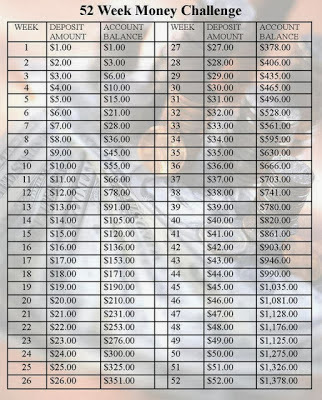 Will you join this savings challenge with the Being Frugal and Making it Work family for 2014? That's an impressive chart and makes savings seem very possible. I save monthly, but weekly would be a good choice, too.